Billy Collins’ pen is a hammer that has been at work building a room for his poems in some pantheon or other. Sometimes that hammer has just the right surface for the nail it wants to hit. Other times, the nail remains unmoved. For most people, and I count myself among them, this is OK. Collins has singlehandedly enlarged the audience for poetry by eschewing what he calls “gratuitous difficulty” in his own work and insisting on clarity above all else. As he put it in the same interview “. . . I appointed myself the poet who’s gonna feel free to take potshots at the whole enterprise. . . If you find yourself as a writer thinking about posterity you should probably go out for a brisk walk . . . “ He is a defender of humor in poetry, which is doubtless underutilized. Aimless Love is a collection. 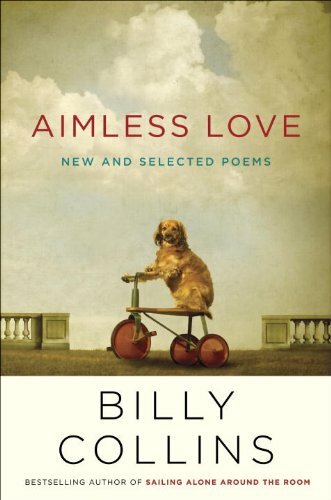 (In this choice of title, bear in mind that Collins advised the same interviewer that “I’m speaking to someone I’m trying to get to fall in love with me.”) In addition to new poems, Aimless Love presents work published in Nine Horses, The Trouble with Poetry, Ballistics and Horoscopes for the Dead. I mention this as a purchaser of these previous texts. There is an appreciable per-page value in this collection. There are poems that do not seem to rise above common prose, e.g., “Best Fall” and “Lucky Bastards” seem more like reminiscences. In a not-so-distant past, such efforts would have been tucked into a charming private correspondence. a constant, shameless sound behind the rib cage. the clouds, the house, the woman, even the laundry. whose colorful name I can never remember. And on the bright unfurled evening of this city. The proper nouns in the poem take on a lilt and sibilance. It produces just the right commemorative effect. This is an unforgettable poem. Collins is a steady presence these days. At the time of this review, he can be heard substituting for Garrison Keillor’s regular readings in The Writer’s Almanac. At the same time, in a pantheon somewhere, a person having great trouble suppressing a smile will be reading a Collins poem aloud to a loved one. The intention is anything but aimless. In the course of what he terms a “dramatic poem,” Hillstrom’s (pen name) ambitious arc takes the form of three voices: poet, woman and welder, brought together “at a historic moment,” a moment never described. This is how the telling, most decidedly not the showing, begins. The scene-setting first couple of prose pages could been condensed into a single stanza. Alternatively, Hillstrom could have supplied a richness of prose detail, created momentum, or sketched a memorable character. This judgement weakens much of “Story,” underlining an intrinsic challenge to interweaving prose and free verse. There are provocative noun phrases in Hillstrom’s work: “plexing trails,” “pensioned eyes,” “common day bonds” that suggest a keen poetic mind.
. . . testimony to our mortality. yet our future is a wax tablet (“The Resurrection of Brotherhood”). The outline of “Story of Our People” has an interesting and potentially fruitful design. “Let the Orchards Blossom” is the title of one section of this work. Perhaps Hillstrom will one day revisit this fine orchard to plant a more durable species.